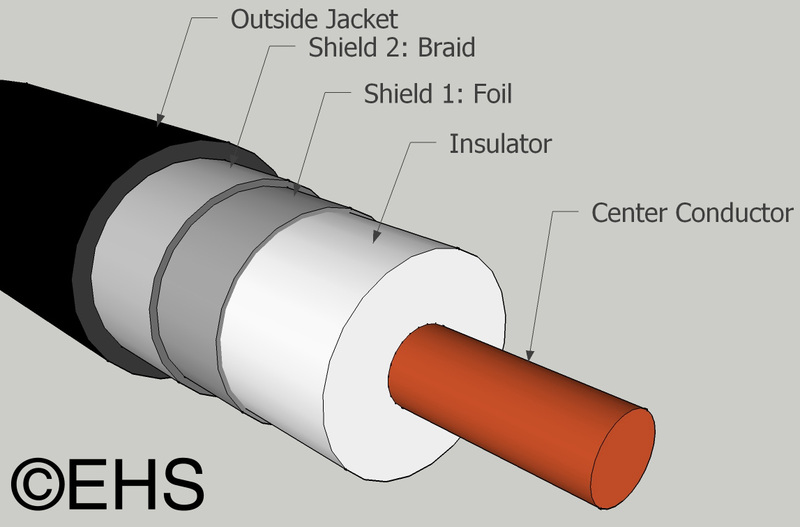 We have put together this page to provide basic information on coax cable. With this information we hope that you can make a more informed choice when selecting your coax cables. 3. (Of a cable or line) Consisting of two concentric conductors separated by an insulator. What that means in the real world is that coaxial cable consists of a center conductor, a layer of insulation around it, a second conductor wrapped entirely around the insulation and a top insulation layer (figure 1). The center conductor carries the signal and the outer conductor is used as the shield/ground/signal return path. Technically most unbalanced cables and instrument cables are coaxial cables but for most applications when the term coaxial cable is use it is referencing a cable that is designed for transmission of RF data like video or digital audio. These coaxial cables (coax) are made with very specific properties to properly handle the high frequency signal. It is a relationship between the center conductor and the shield affected by the diameter of the center conductor, the spacing between conductors, and the type of plastics used and has no relation with the length of the cable. The most common impedances for coax are 75ohm and 50 ohm. For proper transmission the full chain must maintain the proper impedance for example a video signal must start with a 75ohm output to a 75ohm BNC to a 75ohm coax to a 75ohm BNC into a 75ohm input. When you have an impedance mismatch it will cause a reflection of signal power back down the cable, this reflection will mix with the original signal causing loss and signal error. In a way it can be compared to a water pipe if the pipe is strait and smooth the water flows great but if you smash a section of pipe the water does not flow as smoothly. Generally, you don't need to know a lot about impedance-as long as you maintain it you will be good. Attenuation simply defines the amount of loss the cable will have over a distance and is dependent on frequency: the higher the frequency the more attenuation you will have. This is more important on long runs, a high-loss cable might be fine for 1ft but that same cable might lose your entire signal at 200ft. Generally, you want to pick a cable for the lowest loss possible, but sometime other factors play into this like size, weight, flexibility, etc. As a general rule, a thicker gauge will have less loss, stranded center conductor will have greater loss, and a solid copper core will have less loss than copper clad steel. Bandwidth defines the maximum frequencies the cable is specified for at a specific length. Sometimes this information can be hard to find or they will just give you a maximum frequency on an attenuation cart. At short lengths cables are very forgiving, you can probably run 3G HD-SDI (video signal) down about any cable for a foot or two, but if you want to be certain it will work you need to pick a cable with the proper bandwidth. As a general rule, a cable that has a higher bandwidth will have a better shield. Shielding is how the shield is constructed. Shield options are foil, braid, and wrapped. A common type for RG6 will be 60% braid - 100% foil, this is a dual shield. You can find shields in almost any configuration depending on the application. Shields can be single layer or up to four layers. Foil will shield better at high frequencies but often makes for a stiffer cable. Braid is commonly paired with foil; with a single braided shield it is impossible to get 100% coverage. Wrapped shields in coax are not very common, probably because as the cable flexes it can open gaps in the shield. Interestingly, the coax shield in an RF application is used as much to keep the signal in as it is to keep interference out. And that is just one page of one of my catalogs. The only consistency there is the 18ga size of the center conductor. Even though there may be a great many flavors of one specific cable, the "RG" number can get you in the ball park, but further scrutiny of the specs should be done. At EHS we stock the cables that best serve the most applications in our market. Here is a list with links to the products for quick reference. If you have a specific need please let us know and we'll see how we can help you. To simplify the chart some of the values have been interpreted from known values.